The Wesley Hotel, an authentically preserved Victorian hotel with 62 rooms, dominates the harbor skyline. Crews from the boats at the docks or on the moorings across the street can purchase showers there, including a towel, face cloth and soap. The Flying Horses Carousel (15 Oak Bluffs Ave, 508.693.9481) a designated National Historic Landmark, is the Nation’s oldest platform carousel, built in 1876. The Carousel is only open for a very short time from mid-April until Memorial Day but operates daily during the summer months. Oak Bluffs’ famous “Camp Meeting Grounds” is a 34-acre circle with more than 300 multicolored, elaborately trimmed Carpenter Gothic cottages. The gingerbread-type houses remind many of the Cinderella playhouses and a walk through this area is not to be missed. Stop by the Trinity Park Tabernacle when walking throughout the park. The beaches around Oak Bluffs are beautiful and inviting, as is a walk to East Chop Lighthouse, perfect for photo opportunities. 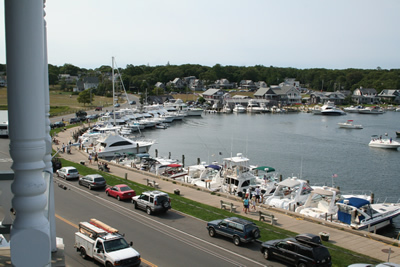 There is no lack of fun and interesting stops in Oak Bluffs for families or individuals. An arcade filled with tourist shops is on the eastern side of the harbor, and an Italian restaurant are also in the area. Bags of ice are available at the fast-food stand at the harbor head, and bike and moped rentals seem to be everywhere. Turning left from the harbor, a movie theater offers nightly features. A fair-sized marine supply store is located few miles away. Circuit Avenue (named for the circuit ridden by many of the Campground preachers) is the main street for shopping. On the eastern side of Circuit Avenue, the Corner Store sells all manner of sundries, from sunblock to the Sunday New York Times. Farther along, there is an excellent small supermarket with a good deli department; Vineyard Wine & Cheese Shop has an impressive stock at the Island’s best prices; long-established Phillips Hardware Store has a surprising collection of hard-to-locate items. Also available is a hairstylist and DaRosa’s office and art supplies store. 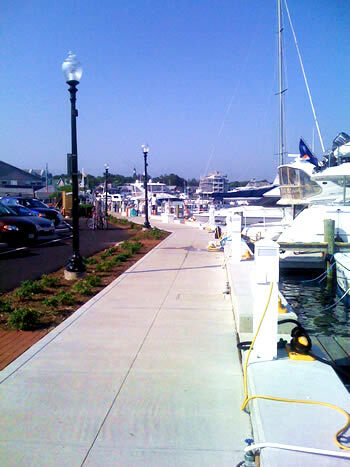 About halfway down Circuit Avenue, to the left in a small walking mall, you will find the post office, a bank, and Martha’s Vineyard Gourmet Café & Bakery. Restaurants are casual, and fast food and breakfast restaurants abound. Slice of Life is very family friendly and serves breakfast, lunch and dinner. Martha’s Vineyard Chowder Co. is touted as the best chowder in New England; reservations are suggested here. The Red Cat Kitchen at Ken ‘n Beck is a good seafood stop. Linda Jean’s has modest prices and is especially popular. Various pubs – Giordiano’s Restaurant, The Ritz Café and Offshore Ale Co. serve food and drink. Situated on State Road in Vineyard Haven, John’s Fish Market/Sandy’s Fish and Chips offers fresh seafood and a menu of fresh, fried-to-order specialties.